I suggest first installing MRTG and become familiar with how to install and configure it on your own system. You can then add to the MRTG configuration to include timekeeping monitoring and a whole lot more. The following commands would typically live in your C:\mrtg\bin\ directory. I have also used MRTG for computer performance measurement, and for a satellite data service signal level and error rate monitoring. The rest of this note is written assuming you have MRTG installed and working correctly. It describes how to extract the data NTP can report (even from remote clients) into a form which MRTG can use, and offers some plotting suggestions. Finally, a couple of other monitoring alternatives are mentioned. There are a couple of steps which are needed on Windows Vista and Windows-7 & 8 which may not be needed on earlier versions of Windows. 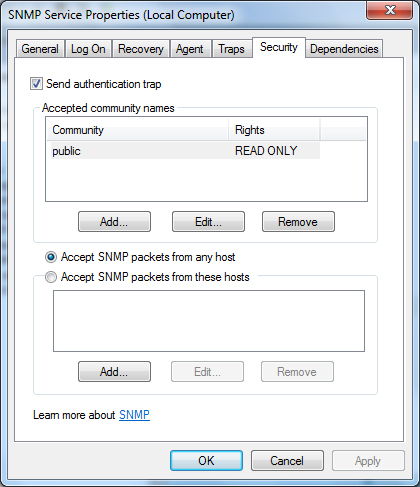 This is because SNMP service which may not be needed by many users is not installed by default, so first you must add that Windows feature, and then configure the security settings for the SNMP service. These steps are also described here. 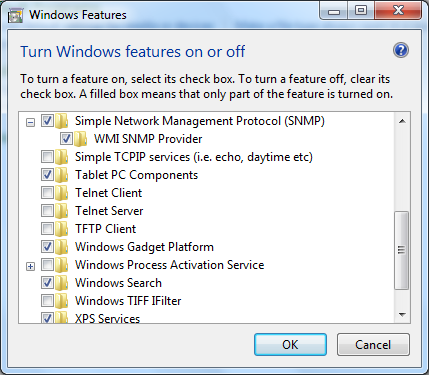 Likely you will also need to add ntpd.exe to the Windows Firewall, to allow it to accept incoming connections. By making the MaxBytes and MaxBytes2 values different, you can get MaxBytes plotted as a red dotted line on the graph, nicely indicating the nominal value if you make MaxBytes half MaxBytes2. So for a 100ms offset from zero for example, you could change the lines as shown below. Legend2[odin_ntp]: time offset in ms, with 100ms offset added to ensure it's positive! With Windows PCs synced from a local stratum-1 reference clock, a range of +/-3 milliseconds is more appropriate than +/- 100 milliseconds. A different Perl script is required to extract the offset data. One oddity here is that when specifying 6000 (�s) as the maximum value for the graph, MRTG seemed to set a value slightly greater than the 6ms I wanted, so I had to set the maximum to 5990. This had the unfortunate effect that when the offset exceeded 6000, the last value less than 6000 was plotted, rather than the 6000 limit. Hence I changed the Perl script to limit the positive value it returned to 5985 in an attempt to ensure that values over the limit are displayed as such. Legend2[narvik_ntp-b]: time offset in �s, with 3000�s offset added to ensure it's positive. Version for ref-clock sources, displays +/- 20 �s. In February 2006, I added a simple stratum 1 server, and added a different version of the Perl script to cover the more limited range of +/-20 microseconds (displayed as 0..40 �s). By July 2006, the GPS was failing more often (tree leaf growth? ), so I modified the script to limit on both positive and negative excursions (as without the GPS the server could be hundreds of microseconds out). This script was later modified for rather less accurate Windows-based ref-clock systems, so that an offset swing of +/- 500 �s could be displayed on a scale of 0..1000 �s. Here's an interesting result - a PC which is normally fairly lightly loaded runs a particular job once a week. During the job, the CPU is used intensively, and jumps up from a few percent to almost 100% usage. CPU gets hot, warms the interior of the PC and hence the clock crystal, so NTP starts to compensate for the warming by changing the system clock divider. While the rate is changing to accommodate the new crystal frequency, there is an offset as a result. This quite neatly captured in the graphs below. Note that the offset may exceed 3.0 milliseconds - it's clipped for presentation purposes. An alternative first suggested by John Say is to plot positive and negative offsets as two separate graphs. Although John didn't use this, it would allow automatic scaling rather than the fixed scaling of the earlier approach. I have based the suggested Perl script and MRTG configuration file on John's approach, and I'm using microseconds rather than milliseconds as it suits my systems better (although the prospect of seeing k�sec rather than milliseconds is rather offensive!) These files are my first attempt, and will likely be revised in the light of experience. $ntp_str = `ntpq -c rv $ARGV`;       # execute "ntpq -c rv <node>"
$val =~ s/offset=//i;                   # remove the "offset="
Here is my earlier information on the topic - a text file.